Northampton Saints are entering their third season with Italian kit manufacturer Macron, and it’s safe to say that they kept things pretty traditional for the first two seasons, at least on the home shirt front. The initial jersey was the classic Saints black, green and gold hoops, and the tweak for 2017 kept things pretty much the same asides from the addition of a prominent black shoulder yoke. That was clearly a sign of things to come, as for 2018/19 the Saints home shirt has gone back to black in a big way – with the entire top half of the design being all black. It’s a bit of a departure for Saints – black has always been a part of the home shirt, but never quite as much as this. Even in the dark old days of the mid-2000s when the Premiership decided to ban hoops for some stupid reason, green was the main colour chosen. 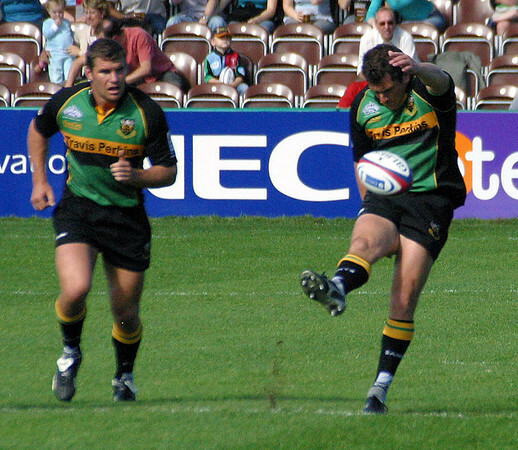 Thankfully hoops are now very much allowed again, of course, and as a result we get a nice segment of green-gold-green hoops that make the bottom half of the jersey feel a lot more like a Northampton Saints jersey. But other than that… well… it’s very much black all over – and the back of the jersey is totally plain asides from the green-gold-green piping and accents on the sleeves and collar. But when a team abandons its traditional look, especially when that look is so timeless and historic, to embrace the sleek and slinky black thing… it can feel a bit try-hard. And that’s what this jersey is to us – it’s a nicely designed shirt for sure, but we’re really not sure it should have been the Saints home shirt. Too much black. They have such a distinctive color scheme, and this design looks like they’re too shy to embrace it.